Lovely day in the Red Barn today. Terri A. came for her second spinning lesson, and she had really done her homework - she brought back a spindle chock full of lovely yarn that she had made on her good ol' Ashford boat anchor. And in just a couple of days, she had put a good dent in the bump of roving I'd sent her home with. (Terri also enjoys a good hot cup of black coffee in the morning, so you know she's our kind of gal.) It's always such a privilege to pass the baton to the next new spinner. Today's lesson included working with a wheel. 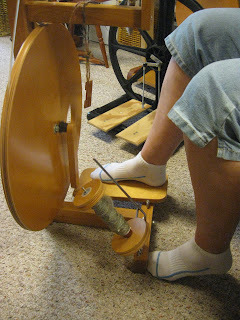 We went over all the parts and workings of two different kinds of wheel (Scotch tension and bobbin lead), and practiced "spinning" some commercial cotton yarn onto and off of the wheel as we treadled. In the end, she decided to take the Louet home to practice with until her third lesson next Tuesday. There are so many different aspects to working with wool, it's hard to squeeze it into three 2-hour lessons, but that's plenty of time to decide that working with wool is the way you want to spend the rest of your life. We may play with hand cards and the drum carder next time, and talk about wet felting and needle felting and dyeing wool in pickle jars in the sun. Anyway, Terri's doing very well as a beginner and I expect that she'll soon be planning yarns and knitting projects, and amassing a respectable stash. Muahahahaha. Another one in the trap.